Rising up in the slush – A gift for you. I love info-graphics. I can get totally sucked into a great image filled with words and data and tips. Sometimes in my day job I even get to make my own info-graphics to help explain complicated ideas, so for fun I thought I would make a few info-graphics just for Novel Pitch. Here is my first one for all of you. Rising through the slush pile is hard. 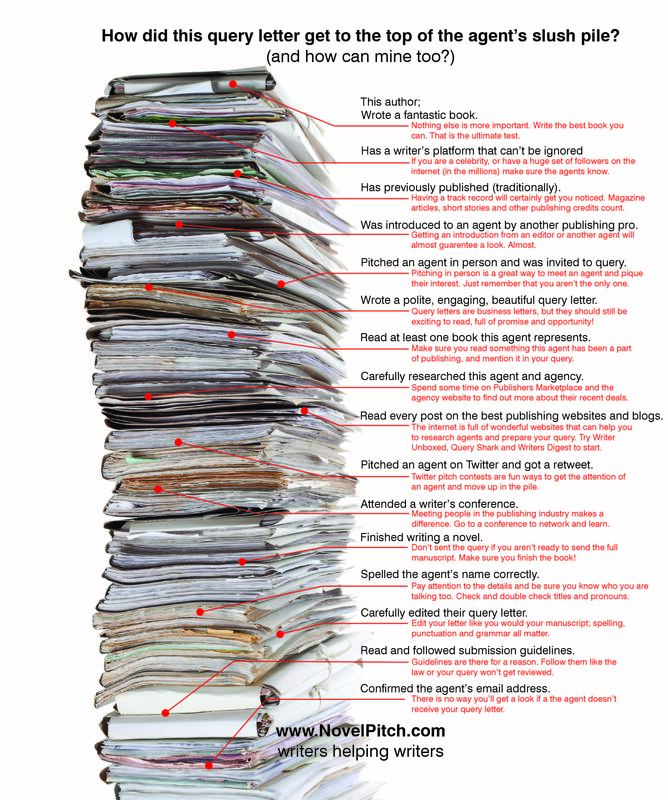 Literary Agents receive dozens, if not hundreds of new queries every day. If you want your submission to make it to the top of the pile pay attention. This info-graphic captures 16 tips that I have heard, and read over and over again. They aren’t the only tips out there, but this is a good list to start. I’d love to hear your tips too, so if you have any to add please send a comment. If you’d like to download this image to print or share, feel free. Here is a PDF version for easy use. Good luck with your queries and your pitches! Share your success stories here.